This beautiful binding of The Myth of Sisyphus and Other Essays by Albert Camus was crafted in 2013 by Haein Song. 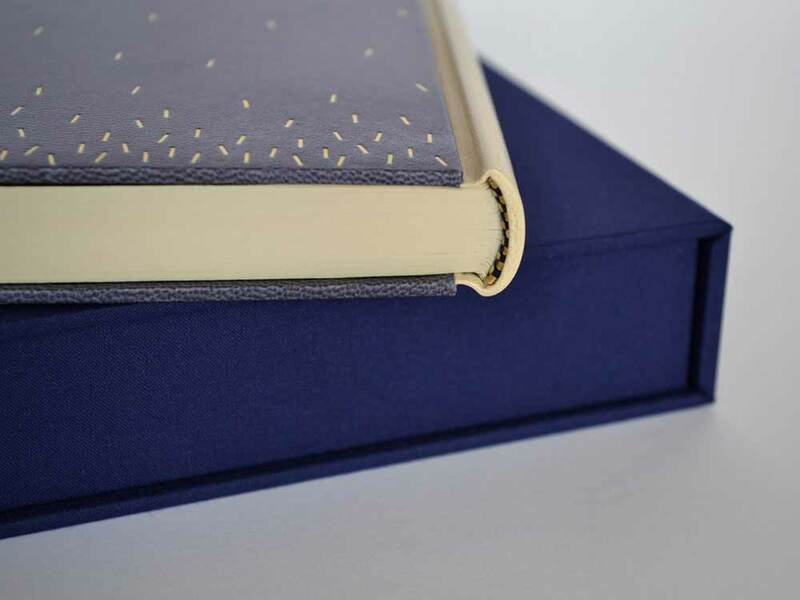 Bound as a Bradel binding, the spine is covered in a natural goatskin with dark blue vellum covers. 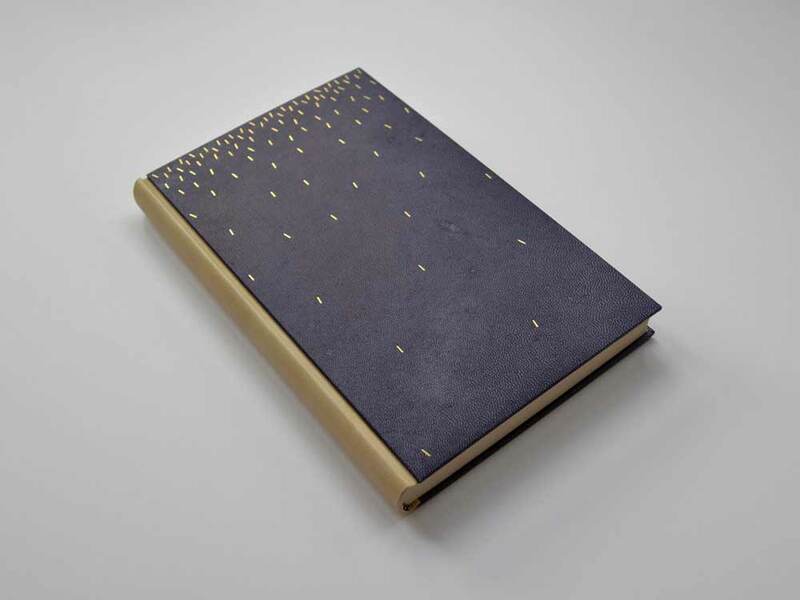 The sprinkled dashes on the covers are hand tooled in gold. The spectacular endpapers are hand printed. This binding is absolutely stunning and so flawlessly executed. The covers are a beautiful dark blue vellum. Did you find the material difficult to work with in either the structural or tooling aspect of the binding process? I have a single experience with vellum over boards, but I know that bookbinders approach the board construction differently. May I ask if you prepped the boards for the covers in any particular way for the vellum? I heard few notorious rumours about vellum but I don’t think I found it difficult at the time I was working on it. Partly because it was a relatively small bradel binding and there wasn’t headcaps or joints. The spine of the book is covered in natural goatskin. What I found afterwards was that the front and back vellum boards sometimes change their shapes depending on the humidity or temperature of the surrounding. But surprisingly it comes back to the original shape after some time. I was told that it needed a little bit of time to climatise. Later I was also told that lining vellum with a very thin paper (archival bible paper or Japanese paper) would reduce this changeable characteristic. Tooling wasn’t particularly hard after practising enough on sample boards but I don’t think I have an ample amount of experience to compare differences in tooling on leather or vellum. 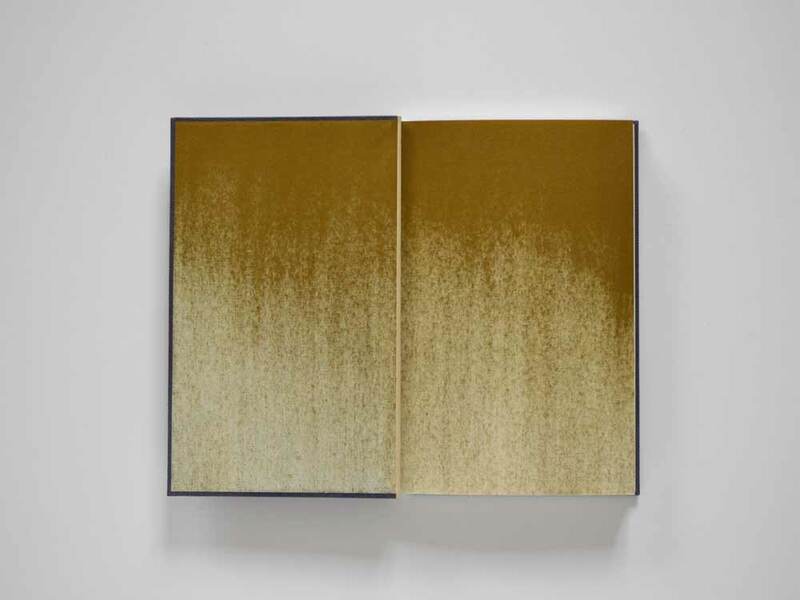 I have not yet had the pleasure of meeting Haein or been presented the opportunity of viewing her work in person. However, I’ve had her website bookmarked for a while now, checking back from time to time to ogle her work. As I began preparing a list of people to interview this year Haein’s name popped up as a suggestion from Hannah Brown, whom I interviewed at this time last year. So with Hannah’s endorsement and my growing fondness, I present the following interview with Haein Song. 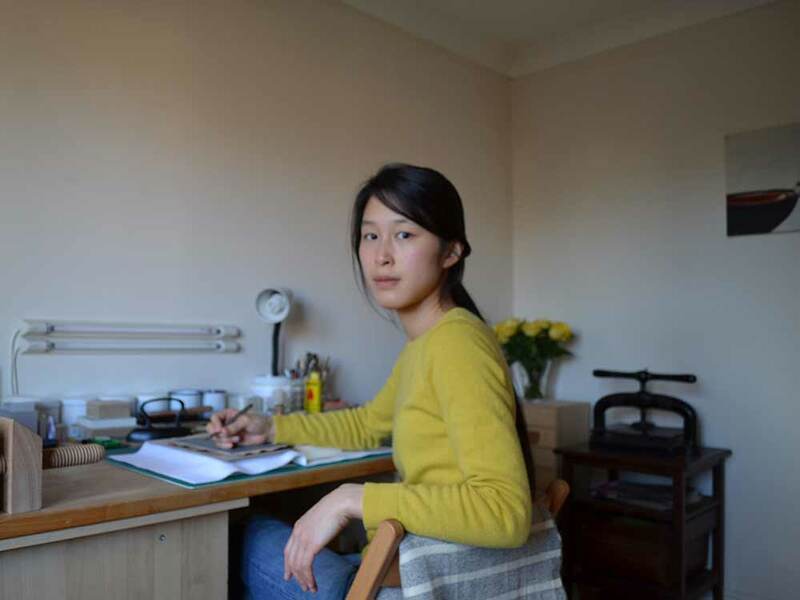 The interview ends with Haein’s elegantly worded philosophy on bookbinding. Come back every Sunday during the month of February for more posts on Haein’s work. You don’t want to miss it, Haein shares some of the creative techniques behind her expressive and artistic bindings. You’re currently employed at Book Works, a London-based organization specializing in artists’ books, which contains both a publishing house and bindery. Could you describe a typical day for you at the bindery? Are you working alone on projects or in collaboration with other binders? I think not having a typical day is typical at Book Works. The type of work ranges from repairing a miniature book to making a box as large as 1.5m, where three of us can lie down inside. The beauty of working there is that I do not know what I will be working on next day. We have 4-6 binders working on a daily basis and depending on the projects we work solely or collaborate with each other. I feel fortunate to work with very skillful and open-minded people. If we go back to the beginning, you started bookbinding at Studio Five with Mark Cockram in 2008. How did you first get into bookbinding and what led you to study with Mark? I was on my second year doing my MA in Communication Design at Central Saint Martins and I wasn’t entirely happy about what I was doing then. Book, design, art, typography have been something of my interest and I always love working with my hands. Wyvern Bindery was on my usual route through and one day I went in to see if they needed an extra hand. They didn’t but Mark Winstanley kindly wrote down a few places and people to contact. Unfortunately I’m not very good at deciphering handwriting and the only piece of information I could read was Mark Cockram! So with a little bit of coincidence and luck I contacted Mark and started bookbinding. I had the pleasure of meeting Mark briefly during a class trip that North Bennet Street students take to London every other year. My classmates and I received an abundance of quick and energetic tutorials. What was your experience like studying with Mark? How was your course structured? Just because you can bind a book it doesn’t make you a good teacher. Mark was and is a good teacher with a great amount of experience and understanding. Mark teaches not only bookbinding but also printing techniques and is very open to any new suggestions and questions. The teaching was almost one to one (or two). I think I started with a simple flatback case binding which was quarter cloth bound with printed paper, then gradually transit into my first bradel binding. As a newcomer full leather binding can be intimidating so bradel binding was a good structure to start. He teaches structured courses and also run an open studio where studio members can come and use the space. Once I became familiar with bookbinding and environment I dropped in with a book I wanted to bind. As a member of the Designer Bookbinders, you’ve held the title of Licentiate since 2011, which after a five-year period can be promoted to Fellow. As a Licentiate, you are assigned two mentors; can you talk about your mentors and what your experience has been? My two mentors are Flora Ginn and Eri Funazaki. I’ve visited Flora’s bindery a few times including the time when she was giving a weekend masterclass on tooling to a few licentiates. She is generous, lively and very experienced. 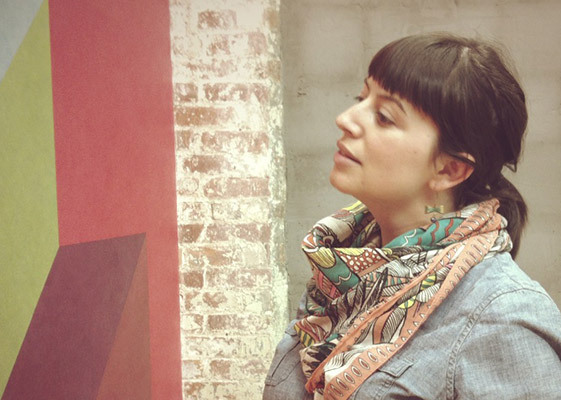 Eri is open-minded, enthusiastic and very understanding. We sometimes meet for coffee and cake and she also invited us to her house for lunch and we talked about bindings and life. In general I found this mentors – licentiates relationship interesting. With a busy modern life we all have, it isn’t easy to visit them more regularly but still it is mentally grounding. It is a very amicable relationship and feels like you are in the community (which also can have positive and negative sides). I must admit that I’m just gushing over your impeccable headcaps. Do you have any tips or tricks for bookbinders that might be struggling with this part of the binding process? Firstly being able to visualise how you would like your headcaps to look like, so you know what you are after and are mentally ready. Turn-ins are pared down to 0.4mm (I use scharf-fix) and steps are removed (french paring knife). Fairly sharp and small bone folder is very useful. Tucking the ears (where the board meets the shoulder of the bookblock) well. Knowing when to hold your breath. Also knowing that you can start again by damping the leather. The designs of your bindings really varying from simple geometric layouts to complex layers. How do you approach the design of a binding; are you inspired by the content itself? Everything around me internally and externally influences the designs of my bindings. The content of the book, the author, life of the author, the broader theme of the text and feeling of the text, where I am (was) at that moment professionally and personally, physically and emotionally, where I live(d), available skills and tools I have (had). Although I don’t think it ever becomes directly descriptive of the text. It can be figurative, abstract or conceptual, and the decision depends on each book and circumstance I’ve listed above. Some texts can be visually more inspiring and others can be intellectually more stimulating. Sometimes a technical requirement from myself is stronger than the design. Empty (silence) space is as integral to the overall composition as filled space. And also colours play a very important role. As part of the application process to become a DB Licentiate, you must include a written binding philosophy. Haein has kindly decided to share the text she wrote for her application. My interest in language, hence written words and books, leads me to the world of bookbinding. It seems to be the natural movement for me: language – book – bookbinding. The process of creating a book deepens the experience of reading and vice versa. It is a process of reading – thinking – making – learning for me and it is endless. I believe that binding a book touches all aspects of mind – body – brain and through this whole experience I feel that my life is integrated.